Camping is just not fun when you’re shivering out of your boots come night time. This is where a warm and comfy sleeping bag comes in handy; with the Coleman Taos Cold Weather Sleeping Bag 2000000102, your nights in the great outdoors are sure to be cozy and toasty. 38 oz. 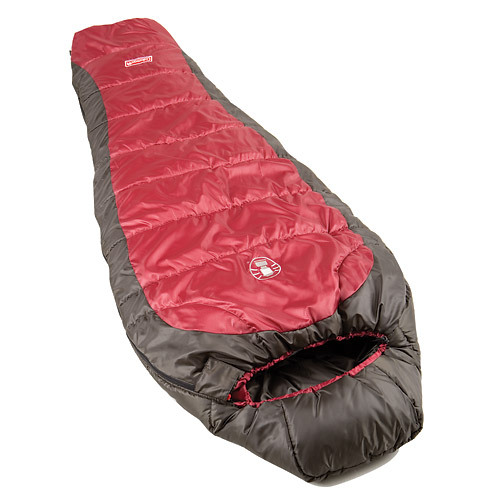 of Coletherm insulation: With 38 ounces of insulation, this sleeping bag is built for warmth. The Coleman Taos Cold Weather Sleeping Bag 2000000102 battles against cold all the way down to 25° F.
32” x 82”: At 32” x 82”, the size of the bag is meant to accommodate the majority of its users up to 6’2”. Comprised of double-batt, offset quilting: The quilting’s construction is meant to prevent any possible cold spots. Full length draft tube: An insulated draft tube is included to ensure warmth by shielding against icy drafts that could otherwise penetrate through the bag. Box foot silhouette: While keeping you warm, the Coleman Taos Cold Weather Sleeping Bag is not too tight and even provides you with extra foot room. Mummy style bag with hood: The sleeping bag is mummy style equipped with a personal hood (semi-sculpted) to help keep body-heat trapped. The Coleman Taos Cold Weather Sleeping Bag is wonderful for campers, hikers, backpackers, and anyone who loves to get out and enjoy nature without being uncomfortable and cold at night. It’s constructed with just the right amount of insulation to ensure a warm stay in most conditions at or above 25° F. If you’re looking to bunker down in a climate colder than that, this is probably not the bag for you. In that respect, it is indeed, an excellent sleeping bag for most campers. The box foot silhouette for extra foot room is also a plus, particularly for those who might feel queasy in tight-fitting spaces. If you’re looking for a comfortable sleeping bag that keeps the heat in, and you want it to be lightweight for those long hiking trips, then the Coleman Taos Cold Weather Sleeping Bag should definitely be on your camping gear checklist. Unfortunately, this sleeping bag may not fit everyone, particularly those who are 6’2” or taller. For those staying in environments that may hit below 25° F, you may want to check out the Coleman Crescent Extreme Weather Sleeping Bag 2000000103, which will provide warmth down to 15° F. The Coleman North Rim Extreme Weather Sleeping Bag 2000000104 is also available, and helps to keep the heat in during temperatures that may dip down to an icy 0° F.
Don’t expect to pay less than $40.00 for the bag – typically set at $54.99 – but for most hikers and campers, getting a warm night’s rest is priceless, and that is just what you get when you own the Coleman Taos Cold Weather Sleeping Bag 2000000102. The Coleman Taos Cold Weather Sleeping Bag 2000000102 provides both warmth and comfort.